The only compelling reason for hitting TRILIGHT yesterday afternoon was because the wife and I decided to take an afternoon nap and woke up later than expected, which threw a spanner in our original plan to see Eastwood Regency (Bedok). So we went in search of a project “nearer” to home instead and TRILIGHT happened to fit the bill perfectly. TRILIGHT is located on Newton Road. The show gallery is located at the site itself – you take the first left after Newton Circus and there it is. And if the directions are still unclear, you can always follow the directional signs that lined the roads. TRILIGHT is a 205-units Freehold project built on the former Elmira Heights site. The 111,000 sqft plot is almost circular in shape, and is supposedly the highest point in Newton. According to the marketing materials, the façade of TRILIGHT has been thoughtfully orchestrated to take in all the sights and lights of the site. With its unique three-pointed start design, the two 30-Storey towers are a reflection of elegance within its surrounding environment. The expected TOP of this project is End-2012/Early-2013. TRILIGHT is developed by the Ho Bee Group, which, if you have been following our blog, was recently featured as the co-developer of Parvis with MCL Land. Given all the good things we have seen (and raved about) at Parvis, our expectations on TRILIGHT were naturally raised by quite a few notches. We must admit we were quite intrigued by the tower design of TRILIGHT. If you are looking for a condo that will stand out from its surrounding, in a nice way that is, TRILIGHT will probably give you that satisfaction. The apartment units are built elevated and start from the 5th Storey. Every apartment unit in TRILIGHT comes with its own private lift, and each penthouse occupies 3 floors, with its own private lap-pool on the highest/roof terrace level. Now THIS is what the wife and I call a Penthouse! Buyers of TRILIGHT will enjoy full condominium facilities like a tennis court, infinity lap-pool, various “themed” pools, children’s playground, gym and BBQ pavilions. The facilities seem rather basic - no cabanas, dining pavilions by the pool, aqueducts etc - and everything is located on the ground level. So this is not a development for those seeking sky garden/terrace. A total of 211 basement carpark lots are provided within the development - this is inclusive of 7 handicapped lots, which basically means 1 carpark lot per unit. So your guests will have to take their chances with roadside parking, or try to convince the security guards that they are handicapped in some manner. The living and dining room comes with 60 x 60cm marble-slab flooring and 3.2m ceiling. The Gourmet (dry) kitchen has a marble shell and frosted glass worktop – we actually prefer a solid surface worktop to glass, as you do not have to worry about the glass top shattering. A “Miele” wine fridge sits beneath and you also get a full height cabinet that incorporate a built-in “Miele” microwave oven and coffee maker immediately behind the Gourmet kitchen. The Asian (wet) kitchen is of decent size (although the wife thought it was a tad small), and comes with a ceiling height of 2.75m. The usual solid surface worktop applies, but the sink is metallic and looked rather “cheap”. “Miele” hood/hob/oven comes standard, and even dishwasher is provided. However, you have to get your own fridge and the space allocated will only fit a single-door type. The wife has noted that the cabinets provided in the kitchen are hardly sufficient, and the design of the corner cabinets is very poor – you will have so much difficulty accessing the contents stored inside that it will probably end up as “dead” space. One side of the kitchen actually opens to the aircon ledge, which occupies a rectangular long strip of area. The ledge not only facilitate access and service of your aircon compressors, but is also the perfect space for hanging laundry to dry, as the small yard area behind the kitchen will probably only allow you to fit in a washer/dryer with little space left to do anything else. The utility/maid’s room is not big enough to house a standard single bed, so some customizing may be necessary to fit a bed in there for your domestic helper. There is a back door access via the wet kitchen area. The master bedroom is located next to the living room, and is of good size. However, we were far from impressed with the quality of the wardrobe provided. The master bathroom is huge, with marble floors/walls, “Hangrohe” bathroom accessories and “Laufen” long bath/WC. The standing rain-shower cubicle can be made larger, while we find the wash basin rather ugly. The unit actually comes with a powder room – this, together with the 2 common bedrooms and Junior Suite, is tucked behind the Gourmet kitchen towards the back on the apartment and accessible via a walkway. So you basically have the kitchen/yard next door to the 2 common bedrooms/Junior Suite. The 2 common bedrooms are square-shaped and smaller than expected, and they share a common bathroom located between the rooms. The standing rain-shower cubicle in the common bathroom is actually larger than the one you find in the master bedroom, and the bathroom comes with standard issue “Hansgrohe” fittings and ugly wash basin. The Junior Suite, located at the end of the walkway, is of decent size (not big). However, the attached bathroom is tiny, and the shower cubicle is only fitted with the normal wall-hung shower, which is quite a shame. But you do get similar ugly wash basin as per the rest of the bathrooms. • Location – TRILIGHT is about 5-mins walk to Newton MRT Station and less than 10-mins walk from the shopping/F&B outlets at Novena and United Squares. 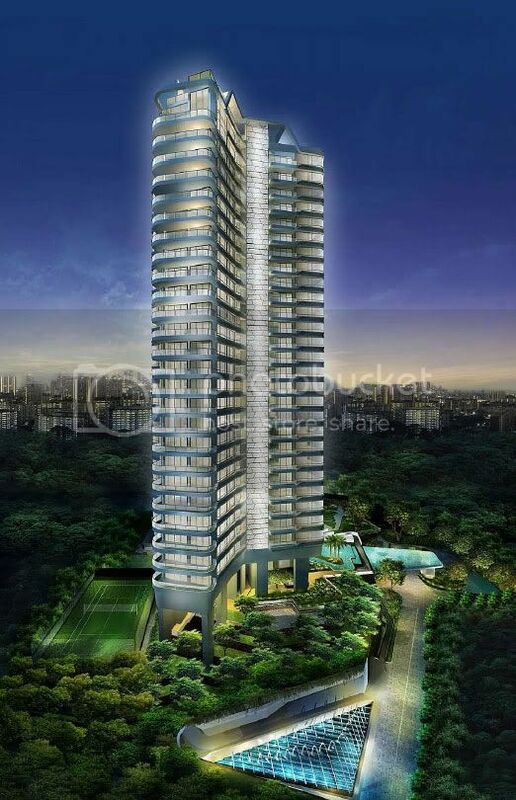 Orchard Road and the CBD are a mere 5 – 10 minutes drive away. So one cannot argue about the central locality that the project offers. • Good size units – Even the smallest 2-bedder is over 1100sqft, which in many other developments these days is equivalent to the size of a 3-bedder. And 3-bedroom apartment that is over 2000sqft is definitely an exception rather than the norm, which you probably will only find in luxury-end projects. Oh, did we mention about the 3-Storey Penthouses? • The unique design of the two towers, and the layout of the 3 and 4-Bedrooms units – all the living areas, including the balcony, have very few odd corners and are highly functional. • Powder room – these are provided in both the 3 and 4-Bedroom units. The wife and I always like the idea of a dedicated bathroom that caters to guests. • Given the central location, buyers can expect good rental demands and yields from expats working in town areas. 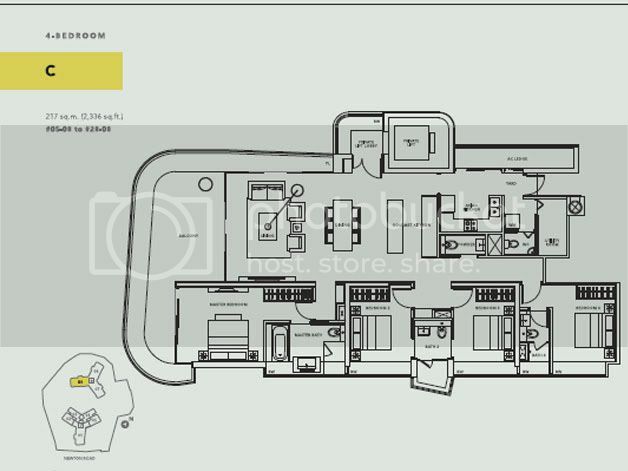 • The common bedrooms and Junior Suite are a tad small for a 2336sqft unit. • The quality of furnishings and fittings are rather sub-standard especially in relation to the type of money you are expected to pay for the units (more later). • The development is surrounded by condominium developments almost on all sides. And many of these are not that faraway – e.g. Residence at Evelyn is only about 22m away from Stack #06. So you may be hit by a sense of claustrophobia especially if you are staying on the lower floors. • The units that are closest to Newton Road (Stack #01) will be subjected to constant stream of traffic noise from this busy road, especially during rush hours. • Only all-boys primary schools are located within 1-km of TRILIGHT – Anglo Chinese Jr. and St. Joseph’s Institution Jr. So for parents without affiliations that need to enrol their daughters into primary school, you may need to have your blood pressure checked more regularly. Price-wise, the flip-side of offering only “sizeable” units is that the lump sum price per apartment is also sizeable. The cheapest two-bedder (on the 5th floor) was sold for $1.82 million. For the 3-Bedroom units, these are going at between $3.5 to $3.7 million each, which translates to around $1670-1770psf. And the 2336sqft, 4-bedder unit that we have viewed? This is a cool $3.8 - $4 million. The sales gallery for TRILIGHT was opened since October of last year, and 50% of the units released so far have been sold. And if you wonder who in his right mind will pay almost 4 million bucks for a condo apartment that is not even a penthouse, hold on to your seat now - 13 out of the 24 units have already been sold. In addition, all units in Stack #5 (2-bedders) are also gone. No Comment to " TRILIGHT (Review) "